We are pleased to present a guest post by Elizabeth Gallagher, Family and Consumer Science Teacher and ambassador for the American Association of Family and Consumer Sciences, in support of something near and dear to our hearts - the family dinner! Although eating together may seem like an ordinary, everyday event, the life skills that our children learn through this simple act will influence them throughout their own adulthood. As a child, I couldn't comprehend the time and thoughtful preparation that my parents spent just feeding us healthy food (or any food, period! ), but the principles that guided their choices about food and mealtime continue to influence me today. Even as an adult, I still choose milk during family dinner. My husband and I incorporate fruits and vegetables into our meal plan. Dinner is still a time when the TV is turned off (and now cell phones put aside), and the focus is on each family member and the conversations and laughter we share. Today, just as years ago, family meals continue to be about nourishing the family, saving money, and placing a value on skills children will need to use when they are off and preparing meals for their own families someday. My name is Elizabeth Gallagher, and I am a local mom of two young girls, living thousands of miles from the home where those first family dinners occurred. I am also a full time teacher at a large suburban school district north of Pittsburgh, teaching Family and Consumer Sciences to middle school and high school students. If you are unfamiliar with Family and Consumer Sciences, it is the present day home economics, and it is alive and thriving in public schools throughout the Pittsburgh area (and the country). FCS teachers like myself are at many local public middle schools and high schools, teaching students skills they will need for success in adult life; skills such as how to promote child development, how to manage personal finances, and how to plan and prepare nutritious meals for themselves and the people in their lives. Skills that fit seamlessly into the family dinner. Recently, my family enjoyed a breakfast for dinner meal. Our menu included scrambled eggs with cheese, chicken apple breakfast sausage, a baked pancake, and fresh pineapple (which never actually made it to the table because we ate all of it during preparation!). Although not quite 3 years old, my older daughter was able to help with the meal preparation as well - cracking and stirring eggs and mixing the pancake batter. You can find the pancake recipe here: http://www.busymomsrecipebox.com/2013/02/pancake-squares.html It is such an easy way to make pancakes, and the sprinkles make it fun. December 3rd is the first annual national Family and Consumer Sciences Day, and to celebrate, the American Association of Family and Consumer Sciences is asking families to commit to "Dining in" on that day. As a mom, I know how important, and sometimes challenging, it is to "Dine in," but the conversations my young family has, the laughter, the sharing, and the time together (not to mention the cost savings and healthier choices that often accompany home cooking) make it worth the extra effort. You can read more at http://www.aafcs.org/FCSday/ where you can register to win prizes for committing to dine in on December 3rd. Families are at the heart of what Family and Consumer Sciences teachers are helping our students learn every day in our classrooms - classrooms all over the nation. So gather up your friends and family, preheat the oven, and join our initiative by committing to dine in with us on December 3rd. I love a good soup, and I buy squash during the fall cheaply. Butternut squash soup sounded good to me. I prepared it one Saturday afternoon, and enjoyed the pot during the week. I even packed it for lunch using smaller Pyrex storage bowls. Maybe you, like me, needed to know what this was. A bowl of hot soup helps you to brave the cold temperatures and take the kids out for recess. After making this soup a few times, I modified the original recipe to fit our tastes more. I also highly recommend a stick blender for this recipe; I bought mine for under $30 at Kohls. The first few times I made this soup, I took small batches and pureed in my blender instead; it was a lot of work. A note about the jalapeno pepper-I use a can instead of fresh since my skin doesn't react well to cutting those. A little bit goes a long way, this soup will be tangy and hot if you use the entire can of jalapenos. You may want to experiment and start with a quarter or half the can. Mix squash and brown sugar; set aside. Over medium heat in a soup pot, combine jalapeno pepper, celery, onion with oil. Saute until tender. Add salt, pepper, broth, and squash mixture. Using an immersion (stick) blender, puree the mixture until smooth. Stir in cream and cumin; cover and simmer for 20 minute. Time Note- I made this soup over two days; the first day, I roasted the squash and diced my veggies. Roasting a halved squash face-down on a lipped cookie tray in a 1/4 inch of water for an hour allows you to scoop out the contents (yeah-for no peeling and cubing). We are excited to share with you our first video clip! You can get a peek inside our kitchens - messes and all. For your listening pleasure, our family dog, Marley, makes an appearance too. We are excited to announce a new addition to our blog and thrilled to pair it with an awesome giveaway! Family meals are important to both of us and so are healthy lunches for our kids. While we don't make lunches everyday, we try to as often as we can. We like to keep things easy and nutritious, and though the fancy lunches with cookie cutter shapes, food markers, and themes are awesome (and make us a bit jealous), we tend to lean more towards the simple side. So, on occasion, we would like to share with you our simple packed lunches. Recently, we were contacted by Bentgo to test out a new product that they are launching today - Bentgo Kids - a durable and leak-proof children's lunch box designed with kids ages 3-7 in mind. We have tried it and it is a hit! The age range is appropriate, as the lunchbox has compartments sized just right for kid-sized portions. My nearly eight-year-old (?!) son needs a bit more than the Bentgo Kids can hold, but it is just right for my 5-year-old daughter. She LOVES this lunchbox - it is easy for her to use, and everything has its own place. Plus, it fits inside the canvas lunch bag that she picked out at the beginning of the school year that she is not willing to give up. I love it, too, because it is so easy to use and to clean - just pop out the insert and throw it in the dishwasher (top rack). We are thrilled to share with you our first lunchbox post - and that we have one of these great Bentgo Kids lunchboxes to giveaway to a lucky reader! Just enter at the bottom of this post! The Bentgo Kids fits nicely inside my daughter's lunch bag for easy carrying, but it would also fit easily inside her backpack. 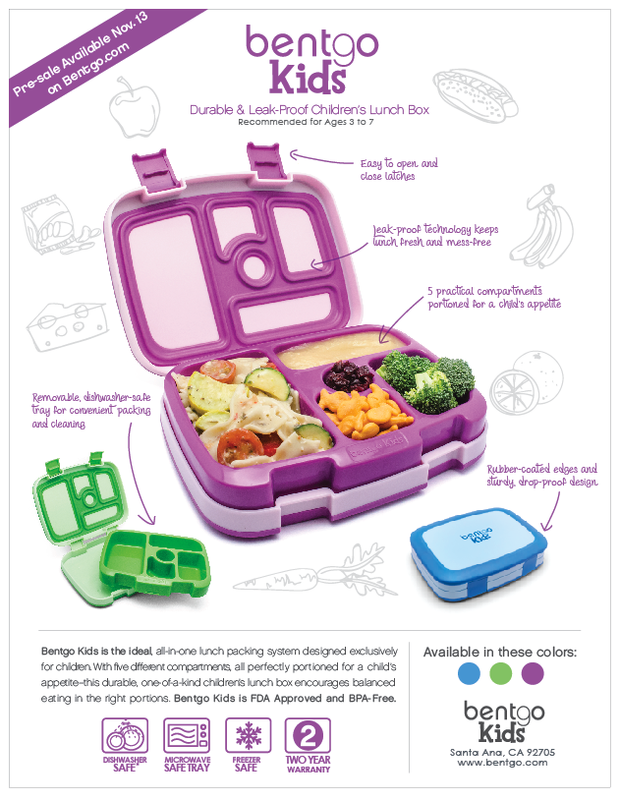 The Bentgo Kids lunchbox goes on pre-sale at www.bentgo.com TODAY (11/13/14)! Enter to win one below! !